Alina is an unlikely heroine. A lonely orphan whose only friend is fellow orphan Mal, she is raised without love or concern for her welfare. Both are recruited into the Ravka army as teens—Alina as a cartographer’s (mapmaker’s) assistant, and Mal as a tracker. Alina is a worrier and a ruminator more than an action-adventure hero. On her way to a frightening mission into the Shadow Fold, a magic and evil place, Alina is deeply fearful. The Shadow Fold, with its Valkyrie, is a great place to be killed. And Mal certainly would have been if Alina hadn’t suddenly manifested the power to summon light. Alina’s power, hitherto unknown, is great. 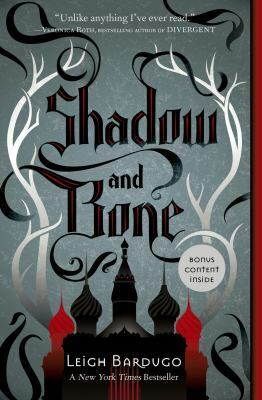 She is taken to live among the magical Grisha and tutored by the Darkling, a powerful and mysteriously charismatic man who is tasked with destroying the Shadow Fold. Her power, in his hands, may save the world. Yet Alina is adrift in the world of the Grisha with its court sycophants, its backstabbers and petty jealousies. She wants nothing more than to see Mal again. Although she writes to him regularly, he doesn’t answer. Perhaps the injuries he sustained in the Shadow Fold battle killed him after all. Perhaps he is just on a new mission. Her own behavior in Mal’s absence bewilders Alina. She had felt that she’d loved him, but always knew him to be a player and kept her heart’s secret. Now, she is drawn to the Darkling and the mission to save Ravka from the Shadow Fold. High school housekeeping: I’m pretty sure that Shadow and Bone is a popular trilogy with teens, but I want to praise it because I think it deserves more readers in my own library and among my students. It has everything that a fantasy reader craves—a sense of mythology (Russian, in this case), magic, monstrous creatures, an epic fight between good and evil, fast action, creepy as well as mystical atmosphere, a love triangle, and a question of trust. Something I enjoyed was the handling of the question of good vs. evil: does good have any physical power over evil or is it just a spiritual power? That’s a question I believe most of us ask early in life. The first time I read a book with an answer that absorbed me was many years ago when I encountered Ray Bradbury’s Something Wicked This Way Comes. It’s quite unlike Shadow and Bone in its storytelling, and yet this novel brought it to mind, connecting Bardugo to one of my favorite tellers of tale. Anyone who enjoys fantasy, myth, or epic battles of good and evil will love this novel. And it has a bonus–it’s not overwritten (and thus overlong) as so many fantasy novels are. This entry was posted in Adventure Stories, Fable/Fairy Tale/Fantasy, Fiction, Romance, Supernatural, Young Adult Literature and tagged adventure, book reviews, Fantasy fiction, good v. evil, Leigh Bardugo, magic, mythology, Russian mythology, Shadow and Bone, supernatural, Teen Issues, YA fiction. Bookmark the permalink.